Yet for you, the family wanting to parent the children born from such a gift, the term 'adoption' makes more emotional sense. You will be giving birth to a child. Adoption is the term that both legally and socially explains the transfer of parental rights associated with a traditional adoption. Adoption also helps to describe and explain to your child the way in which you became a family, since children are 'adopted' rather than 'donated'. Adoption processes provide you, your donor and your children with social/emotional guidance and support in addition to the medical treatments provided by a fertility clinic. 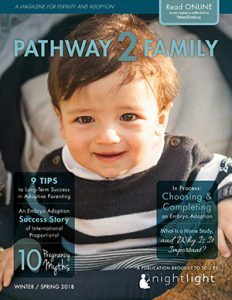 Adoption programs give the donating family the option of choosing the receiving family and mutually determining the level of future interaction between families.